Mentored by one of the most powerful voodoo priestesses in the world, Lillian is learning to use her power. Suddenly, a dark force settles over New Orleans, and Marie Leveau, Lillian’s teacher, is placed under a curse. In fact, the entire town has been put into a deep, dark sleep by a mysterious evil force. Now young Lillian must find allies and uncover the dark secrets of voodoo in order to save her master and free her friends before it is too late in Voodoo Whisperer: Curse of a Legend! 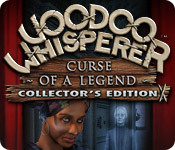 Voodoo Whisperer: Curse of a Legend Collector's Edition is rated 4.0 out of 5 by 26. Rated 4 out of 5 by xtimothyx from Where is the sequel?! This game was fun. But more importantly it ended in a cliffhanger of sorts. So where is the sequel? Rated 4 out of 5 by rosekaufmann from CURSES AND A HIGH LEVEL OF HOS SUMMARY: Took 3 ½ hours to complete at a very casual pace and listening/reading all dialogue for cutscenes. A continuation was promised at the end. Basically, a HOG with a little adventure and a smattering of puzzles here and there. Fairly easy. Seems that much of the length is backtracking to get one item. Not as ambitious as the original Voodoo Whisperer, but still a nice quality game. • Lots and lots of HOS – fairly easy to find listed objects even though each of the scenes’ pallets consist of complementary colors. 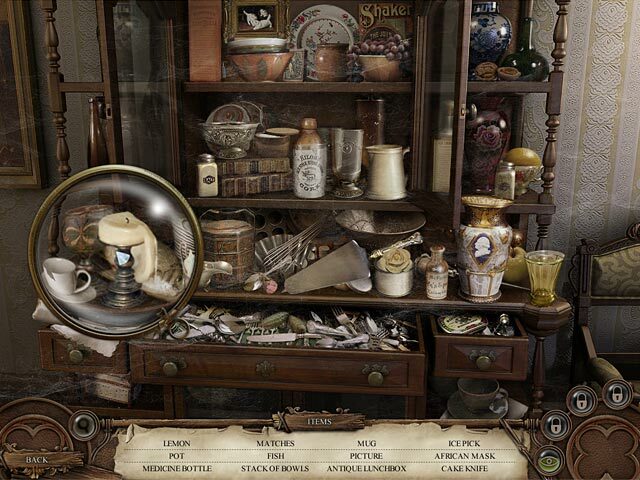 • Magnifying glass provided • Puzzles are the standard fare – matching pairs, rotation etc. • Collect and mix ingredients for the various voodoo dolls you must make to free various people • Lots of backtracking – frequently for one activity before you go back to where you began • Sudden unsatisfying ending – never find out what caused the curse over the town, but that’s probably in the sequel • 4 chapters. If you have the CE, the bonus chapter is in the middle of the game – so it isn’t very long. 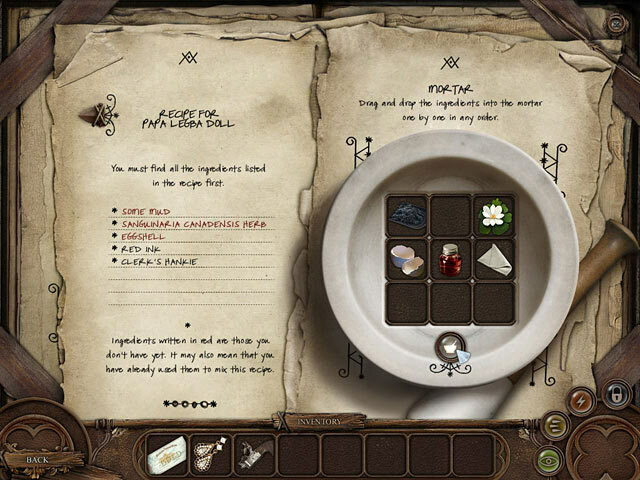 Each of the chapters has you doing the same type of thing (creating a potion or voodoo doll, but at different locations and with different ingredients). • Collect spells to create fire, move large/heavy objects, break things. • Hint tells you where to go or what to interact with. “Area Cleared/Completed” appears as appropriate. Rated 4 out of 5 by neilskinut from good game pretty easy This game was good. Not much for any voice over once the game started. Lots of reading. Graphics were ok and so was the music. Had a good flow with some going all over the place. You get lots of items to use and no place to use them for awhile. The HOS are quit easy and the puzzles are not that bad. No real map. The hint button works good BUT very slow to recharge. It would recharge even it it told you to go to another room. Rated 4 out of 5 by seekinggames from To Be Continued??? Game is easy to follow and fun. Rated 4 out of 5 by letsdoit from VOODOO!....WOOWHOO!... Am coming in late to review but purchased while on 'sale' and just snuck in some time to play between class and homework!...but...was worth it... First....was not crazy about there being a sequel when I got to 'the end'...WHY?...b/c I wanted more game! 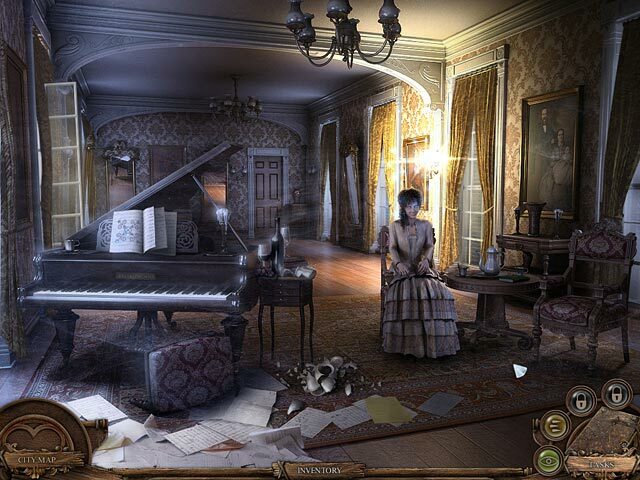 Second...the graphics were superb, detail each scene...the puzzles were 'easy', the storyline was consistent, the H0 scenes were for the time period -learned a lot of different items that were vintage!-...BUT...the music!...so glad it changed about midway thru to a more 'haunting' then an 'agressive' irratainting pounding of ?? ?...cannot remember b/c was concentrating on the 'where to go'! Third...yes wore out a 'pair of running' shoes...wished it had the feature on map to just a 'go to'....so it was a long game for me. Rating it a 4 star + game! What intriqued me most was reading the spells and putting together potions...and at least the 'bodies' looked more 'cursed zombie' then dead!...a plus. Yes!...woowhoo!...great game....just TRY IT! Rated 3 out of 5 by nospaceleft from What a waste!! Before spending good money on this game it would have been nice to know it has no end. Do they really think this "to be continued" is going to make us WANT to spend more on another edition?? I, for one, feel cheated. Rated 3 out of 5 by Mrs_Kim from great graphics, weird story OK, the title sounds catchy. I bought the CE after playing the demo, not knowing that the storyline gets weirder (in my opinion) as it progressed. It is creepy, but the main character is just have weird personality (or is it just me?). I expect there would be a sequel, but no news and I think I will do just fine without one. Rated 3 out of 5 by georgieandharry from not a fan I bought the collectors edition and was disappointed. The bonus game was in the middle of the game as an extra scene and the ending was a cliffhanger. I found a lot of the objects in the HOS scenes too hard to see and a couple were misnamed. Too much going backwards and forwards, and the lack of a journal was a drawback. Also the hint button doesn't really give you a hint, it is more of a direction and then you have to wait for it to recharge. Not really worth the money for a CE in my opinion. Rated 3 out of 5 by SherrieS from so so Based on Demo Great graphics, but I still need more than that to enjoy Girl find family under curse, white majic & solved. Music very weird at first, had to turn off. initial voice overs great but will still need to read a bit I *HATE* slow hint refill & then to add insult you use it for DIRECTION, o yeah, nowhere is there an interactive map-just a map on location, but nothing deeper, no directions, so burn the hint, wait, burn the hint, wait--- you will pick up objects into inventory, but are only used once all needed are obtained, or you completed A before you complete B, can't leave at where it will be used to make room in SHORT inventory scroll. Puzzles are WAY too simplified (guess that is to make up for all the running around eh?# The HOS are good, alot of camo on those graphics, fast click penalty #again slow to recover) and you may need need to burn the *SLOW* hint spell again. All in all I would say SE on a DD if you need to fill a punchcard.